Sunrise Calendar App is an excellent way to gain access to your Google Calendars across multiple platforms. Recently, Sunrise became available as a stand-alone Mac App in addition to being available for iOS devices, Android devices, and Chrome. The best thing about Sunrise right now is that it’s free. It is easy to use and simply gives you easy access to your Google calendar. You can also connect some social media accounts such as Twitter and Facebook, as well as Evernote. It’s simple interface makes it an excellent choice for a Calendar app across all your devices. Here are some other interesting features of the Sunrise Calendar App. 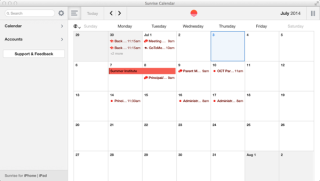 If you’re looking for a calendar app for your Mac, Desktop or handheld device, you will find Sunrise Calendar App's simplicity and ease of use reason enough to download it today. For more information about the Sunrise Apps, check out their web site (https://calendar.sunrise.am/).